We went on a short trip to Hong Kong Last year and fell in love with this wonderful place – we enjoyed not only Hong Kong’s glitzy urban exploration, but also explored (and relished) a lip-smacking food trail, did a really cool nature hike, went on a beautiful cable car ride to instant spirituality and indulged in tons of guilt-free shopping! We get tons of questions from friends, family and you guys about places to see and explore…as well as Things To Do in Hong Kong, so without any further ado let us take you through our 4 nights – 5 days Itinerary of Hong Kong. We arrived Hong Kong at around 9 AM by Cathay Pacific and took the airport express to the Kowloon station and from there took the hotel shuttle. We stayed at the Dorsett Kwun Tong and loved our stay there, you can read our detailed review on the hotel HERE. Check in was a breeze and after freshening up and relaxing for an hour we headed out to explore the city. 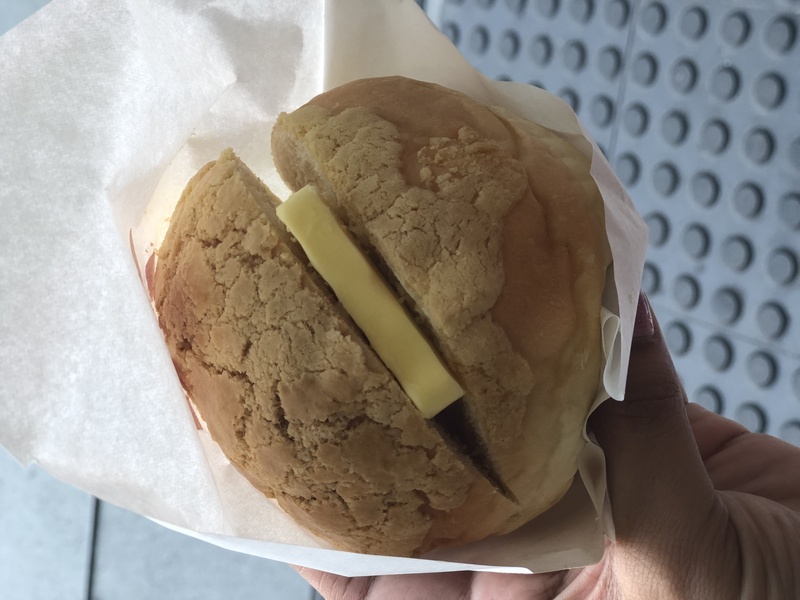 We took the MTR to Mongkok to have the famous Pineapple bun, milk tea and French toast at the Kam wah café. Well our experience was a tad bit underwhelming, maybe we had just too much of expectations from this place, but as it turned out it is just about a regular local eatery made famous. You can read our detailed review for Kam Wah Café HERE. After a rather below average start we ventured out to explore our first tourist attraction, the Victoria Peak. We were there on a public holiday and hence the queue to the ticket counter was painfully long. There were hoards of people lining up first for the tickets, then waiting for the Funicular tram, since it’s a just a single track (the same tram goes up and comes down) and hence the waiting time can be really really long. We had timed ourselves to go to the peak at around 6 pm so that we could see the day light views as well, but it was an epic fail as after much struggle we finally reached the top at around 7:30 pm and sun had already set. The good part though were the views 🙂 The city glistens with lights in the night and looks amazing. What’s more- we were left with that longing to come back to catch the views in the daylight! Top Tip – If you want to save enormous amounts of time, don’t go on a weekend or public holidays. Also, we recommend you pre-book your tickets with Klook. For dinner we had reserved a table at the Bubba Gump Shrimp Co. at the Peak Tower itself. The views from here are amazing as well, but we found the food to be just about ok. You can read all about our eating experience HERE. After relishing a great breakfast spread at the hotel we headed to the Tian Tan Buddha or the Big Budha statue situated at the Lantau Island. We had to change the MTR twice, then take a long Cable car ride (25 minutes), walk through a themed village and then climb 268 stairs to finally reach to the Tian Tian Buddha… but it was worth all the effort. The views were gorgeous from up there and even though it was again crowded with lots of tourists, somehow the place had a serene calmness to it. We also visited the Po Lin Monastery and tried some food at the vegetarian restaurant/café situated in the compound. Confession Time – we did not like anything we ate here, so our advice would be to give it a miss. On our way back we explored a bit of the Ngong Ping Village, which was our last halt here. We were quite excited to see that it had its own Starbucks, but we gave it a miss and savoured a few traditional sweets instead. There are a few other attractions which you can visit here and we attended the Walking with Buddha Multimedia presentation which was pretty impressive. On our way back we halted at Tung Chung and visited the Citygate Outlet which houses a variety of factory outlets. 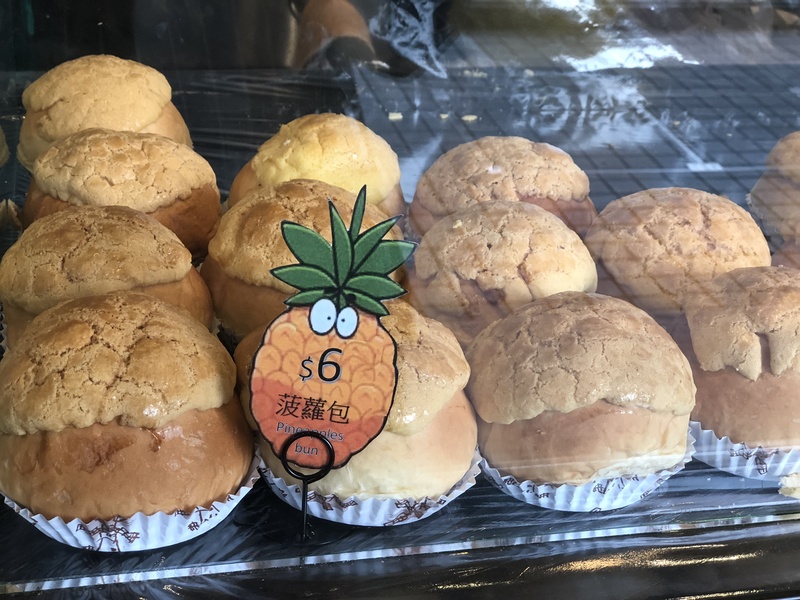 Didn’t quite fancy anything here, BUT what we did find was THE BEST Pineapple Bun in Hong Kong at a place called Pineapple Canteen!!! From there we reached Mongkok towards the evening and headed straight to SASA to do some serious shopping for skin care 🙂 Before we knew it, itwas already 7:30 pm and we rushed to Tsim sha Tsui to catch the Symphony of Lights Show. The Hong Kong Skyline looks very pretty especially when it glitters with the light show, but the show in itself does seem a little outdated. Having said that, it is still quite a crowd puller…I personally didn’t get too bored as I was enjoying the quintessential post-card views of the Hog Kong Junk Boats sailing through the river with a glittering skyline in the back drop. From there we went to the temple street market for some souvenir shopping. Our initial plan was to enjoy some street food, but we ended up having some really good Indian/Nepalese food at a small little joint called Manakamna. Post that we headed back the hotel and later in the night we ventured out for a short walk towards the Kwun Tong Promenade before we called it a night. 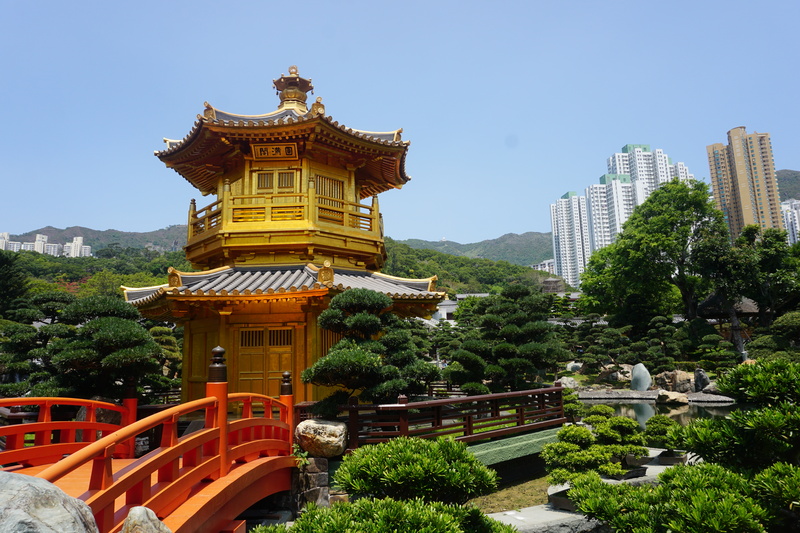 Our spiritual journey continued on the third day and it took us to the Nan Lian Garden, a peaceful little green patch within the city with beautiful flora, tranquil water bodies and stunning shrines. The backdrop of multi storey buildings gives a perfect contrast to the scenery. After spending a good hour and a half of finding our spiritual self we quickly decided to indulge in some retail therapy and headed towards the Plaza Hollywood Mall and shopped to our hearts content. We ate at Mcdonald’s and we loved the Signature Pineapple Chicken Burger so much that we ended up eating at Mcdonald’s that night as well. Cathay Pacific had an offer running at the time we booked our flight tickets and we were lucky to get free entry tickets to Ocean Park and that is where spent our evening. The later half of the evening we spent roaming around at Kwung Tong area, near our hotel and explored some more factory outlets and tried some delicious street food. For many of the tourists Hong Kong is just an urban destination with lots of amusement parks and plethora of shopping opportunities, but the fact is that Hong Kong has some of the best beaches and some really great nature trails to reach to these beaches. We could only do only one such hike on this trip, you can read about it in detail HERE. 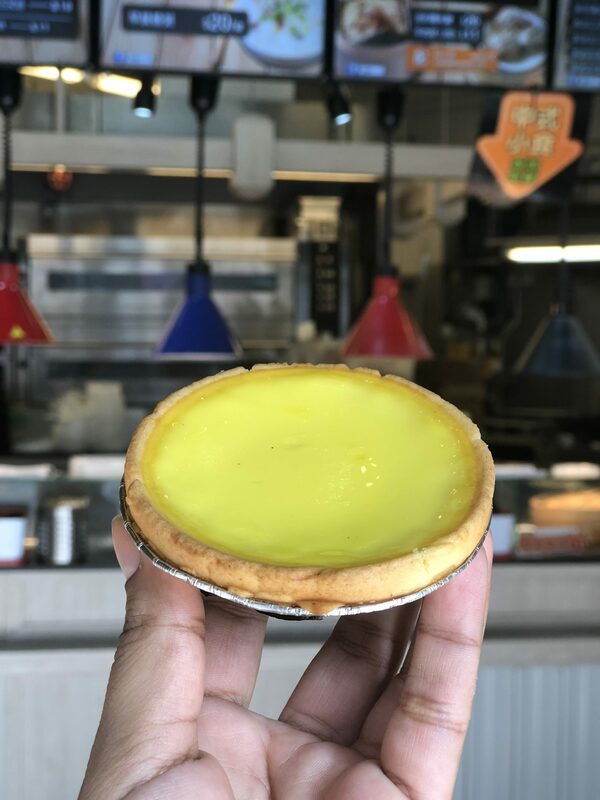 After a good morning’s workout, we wanted to reward ourselves with some hearty lunch, so we headed to a Singaporean restaurant that had caught our eye during our night strolls around the Kwun Tong area. The food here looked so tempting, there were mouth watering images of Hainanese Chicken rice and considering we’d been wanting to go to Singapore and try out their delicious Hainanese Chicken rice at the hawker centres, we couldn’t resist ourselves from trying it out here. Sadly, the food wasn’t that great! We found it to be rather bland…now whether it was this restaurant’s version or Hainanese chicken rice in general is like that, we would only know once we go to Singapore and try it out there. Later in the evening we went to a neighbourhood called Whampoa as it has one of the bigger Sasa stores and did some more skin care shopping (a girl can never have too much skincare!). From there we went to Tsim Sha Tsui, took some photos with the Hong Kong Skyline in backdrop and hopped on a ferry to Hong Kong Island to check out the Hong Kong observation wheel. Once the hunger Gods started calling to us, we took a tram ride to Wan Chai to have rotisserie chicken at a restaurant someone had suggested, but sadly it was shut. We decided to walk around the area and explore some eating joints and ended up going into a thai restaurant called The Spice House which was jam packed with people (always a sign of good, fresh food and service!). The food was incredibly delicious and even cheap..win win! We ordered our all time favourite pad thai noodles and chicken red thai gravy with Jasmine rice and it was by far the tastiest meal on our Hong Kong trip. We also used this time to return our Octopus cards at the customer service centre in the mall itself and got the balance back in cash. By now it was time to head back to the hotel to get our bags and from there we took a taxi to Kowloon station. We checked in our luggage and got our boarding passes at the Kowloon station itself and took the airport express Luggage-free (how cool is that?!) to the airport. Top Tip – You can show your taxi receipt to get a 50% off airport express fares. Check out this link. At the airport we had ate lunch at Popeyes, which is somewhat like a KFC and then we had a some egg tarts from King’s Bakery (told you before!) and with that we concluded our trip. We realised on this trip that there is so much more to do and see in Hong Kong, we definitely wish to come back for some more nature hikes, awesome food (we missed eating at the very famous Tim Ho Wan), Disney Land (once the renovations are done ) and off course get lost in the aisles of the wonderland called Sasa!! !